Sugar-free, Gluten-free, Vegan, Oil-free…oh my! Preheat your oven to 350. Spray your bundt cake pan with coconut oil spray and set aside. In a large bowl, combine coconut milk and apple cider vinegar. This combination make vegan "buttermilk". In another small bowl, make your "flax egg" and let it sit until it becomes the consistency of an egg. Add to the bowl with the vegan buttermilk. Mix the coconut sugar, carrots and vanilla to the bowl with the other wet ingredients-- the vegan buttermilk and flax egg. In a separate bowl, lightly toss together the dry ingredients before combining them with the wet-- Oat flour, baking powder, spices. Whisk the dry ingredients into the wet ones and fold in walnuts. Pour into the bundt form and bake for 45-50 minutes or until a toothpick is inserted in the middle and comes out clean. Meanwhile, let the coconut cream become room temperature and then use an immersion blender to blend in the agave and vanilla. It will become smooth and silky-- this is your vegan icing! 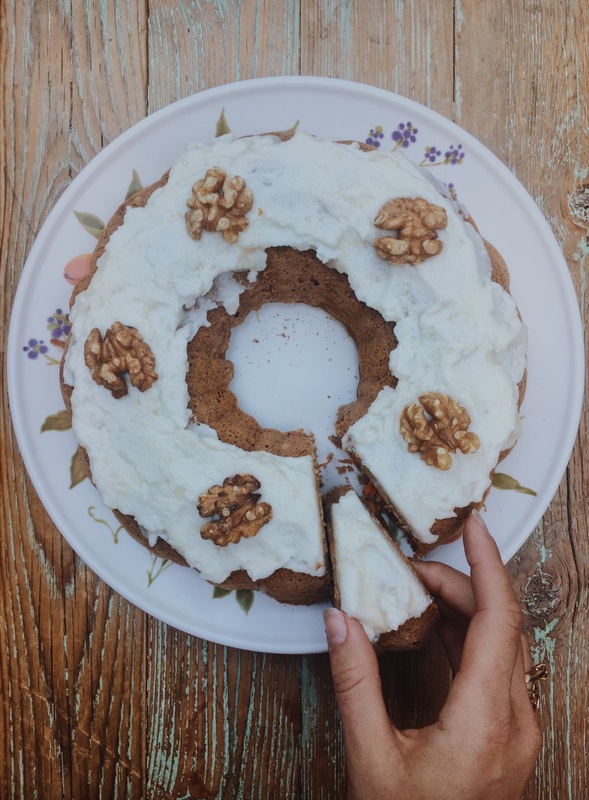 After the cake sets, is out of the bundt form and has a chance to cool, spread your icing and top with walnuts. Enjoy!